A most unusual design to bring you the sounds of modem stereo. cover. Ceramic cartridge; padded 11-in. turntable. Diamond needle. Volume, bass, treble and balance controls. NOTE : All item• UL listed lo< 110-120-volt. 60-cycle'il.C. 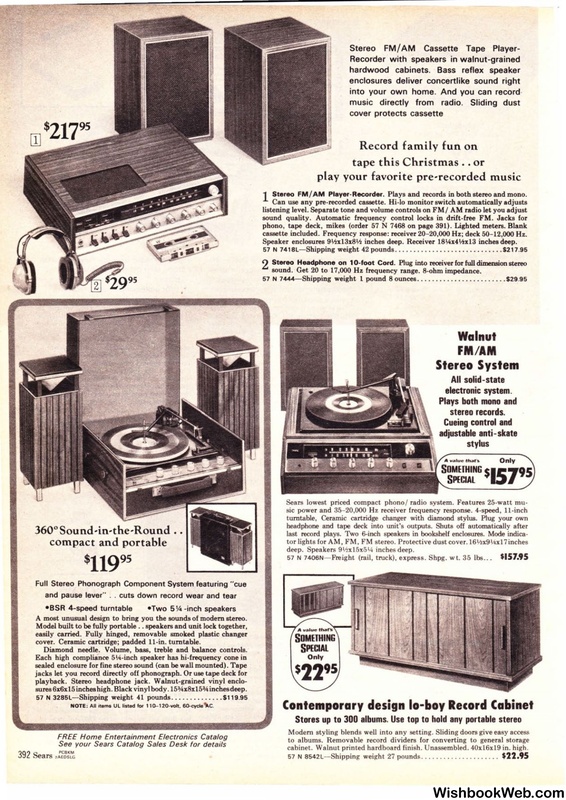 Plays and records in both stereo and mono. cassette included. Frequency response: receiver 20- 20,000 Hz; deck 50-12,000 Hz. inches deep. Receiver 18\4x4"2xl3 inches deep. Stereo Headphone on 10-foot Cord. sound. Get 20 to 17,000 Hz frequency range. 8-ohm impedance. hx15x5 \4 inches deep . 57 N 7406N- Freight (rail, truck), express. Shpg. wt. 35 lbs. . .
cabinet. Walnut printed hardboard finish. Unassembled. 40x16x19 in. high . 57 N 8542L- Shipping weight 27 pounds . . ... . . .. . . . . . . .. . . . .